Marriages are special occasions. Really special! And when two love-birds have decided to sign the eternal bond, you too would want to wish the dear ones with nuptial bliss. This article offers some amusing ideas to wish the couple a happy married life ahead, but in a different way. What better way to make the occasion more memorable for them and to ensure that they think fondly of you always. Funny Greeting Cards : There are a plethora of greeting cards available in gift shops that carry humorous undertones. These cards have funny and mischievous jokes and lines written on them along with equally funny graphics. You can choose from the slew of animated e-cards and traditional cards specially designed for soon-to-be married couples. The colors like orange and yellow always make people happy, so try to pick the right colors rather than going of traditional reds and pinks. You can also pick up a card that depicts the soon-to-be-married damsel and dandy's favorite cartoon characters. Funny Poems : If the soon-to-be married couple happens to like poetry, then there is no better way to wish the engaged than with an eloquent poem smacked with every ingredient of humor and fun. For example, you can hint at the funny side of married life or you can even find humor in how much the soon-to-be wed love each other. Humor is humor till it is accepted. Not everyone can take it. So be careful and do not cross the line. Singing Telegrams : Wishing the loved ones by crooning some heart touching lyrics with humorous metaphors and phrases can make your congratulatory message really one-of-a-kind. Rather than sing yourself, you can send them a singing telegram. The humorous lyrics stating the amusing side of love and marriage along with the best wishes would only leave the couple elated and bubbling with laughter. Funny Gifts And Goodies : You can try gifts such as T-shirts, ingenuous glassware, groom and bride dolls, wedding cake toppers, rules of marriage posters, toys etc., that can tickle the funny bone of the would-be husband and wife. 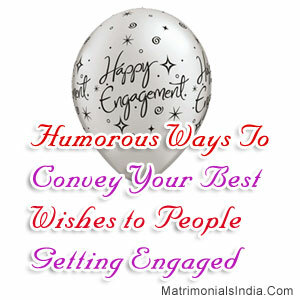 With these unique and humorous ideas, you can be sure that your best wishes will stand out from the rest. Every time the groom or bride thinks back about this special occasion in future, he/she will remember your funny gifts and smile; after all, this is the underlying motive behind giving gifts to anyone, to make sure that they remember you with a smile on their face.